When Marc Sauer arrived in Delray Beach in 2007, he didn’t know one person. 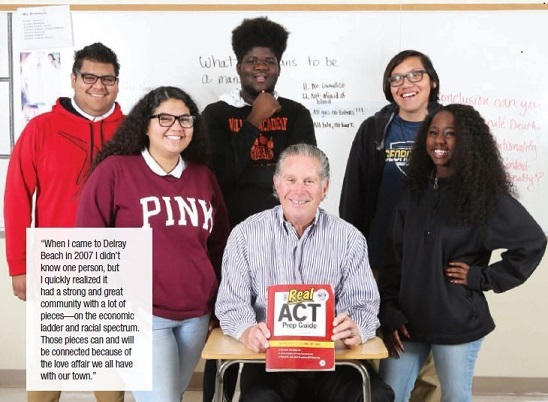 Today, as Chairman & Founder of Delray Students First, he is the driving force behind connecting at-risk students with educational and economic opportunities to reach their potential. THEN: A business executive who earned his MBA at Columbia University, Mark Sauer led a successful career in international finance, serving as chief financial officer of 7 Up International. He then became vice president of finance for Anheuser- Busch’s entertainment division, which oversaw operations of the company’s theme parks. Moving up in the organization, Sauer was appointed chief operating officer of the St. Louis Cardinals baseball team in 1988, and in 1991 moved to Pittsburgh, where he served as president and CEO of the Pirates. In 1996 he began a 10-year run as president and CEO of the St. Louis Blues hockey franchise. “When I write it all down, I still can’t believe it happened to me,” he says.